Bad Religion is an American punk rock band founded in 1979 by Jay Bentley (bass), Greg Graffin (vocals), Brett Gurewitz (guitars), and Jay Ziskrout (drums). They are often credited for being involved in the revival of punk rock and inspiring several subsequent punk bands during the late 1980s, as well as influencing a large number of other punk and rock musicians throughout their career. In the 32 years since its inception, Bad Religion has had numerous lineup changes, and Graffin has been the only constant member, although the band currently features three of the original members. Bad Religion has released fifteen studio albums, two EPs, three compilation albums, two live recordings, and two DVDs since their formation. Almost all of their albums were released on Epitaph Records, started in 1980 by Gurewitz, who still runs the label today. 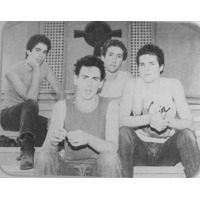 Bad Religion is considered one of the most successful independent punk acts, selling over 5 million albums worldwide. The band earned a growing fan base in the underground music community and critical acclaim, with their 1988 album Suffer cited by some critics as one of the most important punk rock albums of all time. Following a series of albums on Epitaph, Bad Religion signed to Atlantic Records in 1993. The band achieved their greatest success with their 1994 album Stranger Than Fiction, which peaked at number 87 on the Billboard 200, and spawned their well-known hit singles "21st Century (Digital Boy)" and "Infected". That album also became the only Bad Religion album to obtain gold status in the US. Following Gurewitz's departure in 1994, Graffin took over the majority of the songwriting duties, which lasted for the next three albums. Gurewitz rejoined in 2001, making Bad Religion a six-piece band, and contributed to their four most recent albums (the last being 2010's The Dissent of Man). They are particularly known for their use of soaring 3 part vocal harmonies (which they refer to in their album liner notes as the "oozin' aahs"), sophisticated and intellectual lyrics, and political or religious commentary. Their lyrics often relate to matters of social responsibility.